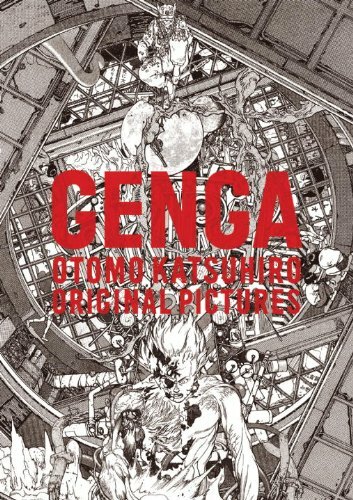 This is the companion artbook to the GENGA exhibition that was held in April & May 2012. The exhibition featured over 3000 pages of manga from Otomo Katsuhiro's 39 years of career since 1973. This is a large 256-page paperback measuring 10 by 14 inches. That's larger that all the other Otomo Katsuhiro artbooks I've seen. While there are some new and unpublished artwork, some have also appeared in other books such as KABA, KABA2, Akira Club, The Memory of Memories, ビバ・イル・チクリッシモ! (VIVA IL CICLISSIMO!) and possibly others. The manga art are printed satisfyingly huge. The scans and reproduction are great. You can see how words are pasted onto the speech bubbles, the details of the ink work and hatching lines and painted illustrations. The format is large enough to show off all the meticulous work put into drawing those panels. There are a few interviews in Japanese but the book also comes with a small booklet with the English translations. If you have other artbooks, I think this is still a great addition. This book was borrowed from Basheer Graphic Books for review purposes. You can order the book from them. Check with Basheer on Facebook or visit their website. They are selling at a good price and if you're near their stores you don't have to pay for the expensive international shipping. Here's Amazon Japan shipping rates and buying guide for your reference. omg, I pre-ordered this originally, but i never received an English translation booklet. was the booklet small as in pamphlet size? do you have to order it from Basheer to get the booklet? The booklet is about A4 size. The ISBN for the main book is the same. So I don't know how come Basheer has the booklet and the one that you bought didn't. You should add links to bookdepository.com/co.uk . They're also selling the book for a good price. If I already own Kaba 1 & 2, is it worth picking this up as well? It looks like the book is reusing a lot of art from the Kaba books.